Drummer/Vibraphonist/Saxophonist Smith Dobson V has been performing in the Bay Area for nearly twenty years. Originally from Santa Cruz, Ca., Dobson is a member of an important Jazz family. 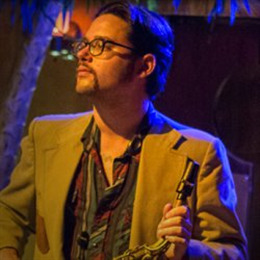 His father, the late Smith Dobson IV, was a world renown Pianist and director of the Jazz series at the Garden City in San Jose for over twenty years, where he accompanied artists' like Art Pepper, Stan Getz, Bobby Hutcherson, Harold Land, Chet Baker, Red Norvo, Tal Farlow, and Lee Konitz, to name a few. Also in the family, Grandfather Smith III is a Jazz Accordionist, Grandmother Norma, Mother Gail, and Sister Sasha are all Jazz Vocalists. The family often performed as a group at the Garden City, and other venues, as well as many local schools and workshops. As a child, Smith V had the opportunity to study with legendary Jazz Drummer Albert "Tootie" Heath, who said of his pupil, "He has the talent, determination and persistence as a musician, combined with the dedication necessary to succeed... improvisational skills totally advanced, excellent sensitivity, both solo and as an accompanist... my most talented student!" Smith got his first shot on a major stage sitting in with his parents at the Monterey Jazz Festival at age 11, and at age 15, led his own band at the MJF, under the first year of director Tim Jackson, who said, "Not only does Smith have the musical expertise to play the MJF, he has the leadership qualities to make it work. His arrangements are outstanding and uniquely his own." Since then, Dobson has been performing with his various groups at many Bay Area venues, such as the San Jose and San Francisco Jazz Festivals, and clubs like The Kuumbwa Jazz Center, Yoshis, Kimballs, Pearls, Bacar, Brunos', The Make-Out Room, Great American Music Hall, Bottom Of The Hill, Amnesia, The Jazz School, The Stanford Jazz Workshop, and The Intersection of the Arts. Smith has had the honor of working with some of the great Jazz artists, locally and internationally, such as Bobby Hutcherson, Red Rodney, John Handy, Sheila Jordan, Red Holloway, Pete and Conte Condoli, Phillip Harper, Hal Stein, Noel Jewekes, Ben Goldberg, Graham Connahs' Sour Note Seven, Darren Johnstone, Will Bernard, and Kenny Brooks. In 2000, Smith was asked by percussionist William Wynant to join him and the San Francisco Contemporary Music Players to perform works by composers Charles Mingus and Anthony Davis, (who performed with the group on his own compositions), for a concert at the Yerba Buena Theater. Smith was also a member of the Ska/Punk/Rock band the Square Roots in the mid 90s'.